Eleanor Antin is among the first generation of American feminist conceptual artists. Her irreverent attitude towards art and its place within everyday life was influenced by involvement in the Fluxus movement – an iconoclastic group of artists including Yoko Ono, that came together in New York during the 1960s. This retrospective exhibition includes a range of media from sculpture and photography to film and video installations. For Antin, historical time is fallible and limiting and she blurs the boundaries between art and life with theatricality and masquerade. Among the exhibitions is the celebrated 100 Boots of 1973, a series of 51 postcards that were mailed to hundred of recipients in the US, Japan and Europe. They feature the adventures of a hundred pairs of wellingtons on an epic journey from the west to east coasts of America. The cards were then exhibited at the Museum of Modern Art, New York. Whether in performance, photography or installation, Antin continues to investigate the construction of identity through a variety of ironic roles. Through exploration of her works, our very notion of self begins to unravel. An illustrated catalogue accompanies this exhibition. It includes essays by Howard N. Fox, Martha Rosler and Rachael Thomas. Supported by the Arts Council England National Touring Programme. I sometimes find it quite strange viewing the work of a living artist in the context of a retrospective exhibition – it’s similar to a compilation of greatest hits by a pop group that is yet to split up. There remains an unanswered question as to whether they have peaked or if the best is yet to come. 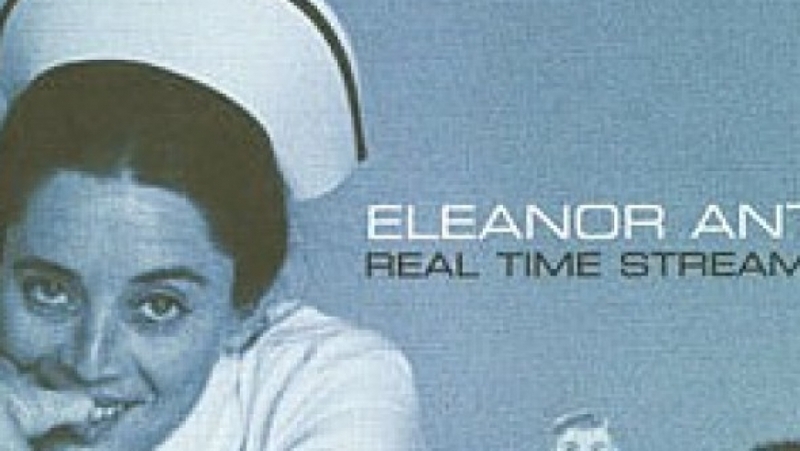 ‘Real Time Streaming’ is a retrospective exhibition of work by the artist Eleanor Antin, a key figure in the American feminist movement of the sixties and seventies. Curated by the Mead Gallery’s Rachael Thomas, the selection of work has been made with an awareness of its relevance both to a contemporary audience and to contemporary practice. This is not only alluded to in the internet-derived title, but also in the numerous catalogue references proclaiming Antin’s influence on a younger generation of artists. This suggests that the resurgent interest in Antin’s work owes itself to the increasing use of narrative and autobiography in the practice of such contemporary women artists as Cindy Sherman, Linder Sterling, Tracey Emin and Gillian Wearing. Throughout her work, Antin embraces the Duchampian desire to consider life as theatre, adopting the personae of part real, part fictitious, historical figures, living their lives in the present and using masquerade as a means of critiquing the socio-politics of American life. These varied personae: the King of Solana Beach, the Nurse (a re-modelling of Florence Nightingale) and the invented alter ego of Eleanora Antinova, ‘the once celebrated, but now retired black ballerina from Diaghilev’s Ballet Russe’ are captured in photographs, video works and drawings. Such has been the influence of Antin’s practice on the later generation of artists that there is a tendency in the exhibition to pinpoint those pivotal pieces that were to have subsequent conceptual acclaim. Carving: A Traditional Sculpture (1972) and Representational Painting (1971) are the type of works unknowingly re-made by art students the world over. Antin dieted for a thirty-six day period, losing ten pounds in weight and physically ‘carving’ her body to its ‘ideal’ form. Presented in a grid form of 144 black and white photographs, Carving: A Traditional Sculpture ironically references the pseudo-scientific work of Muybridge, whilst at the same time pre-empting the future practice of artists such as Orlan. Representational Painting is a short video piece in which Antin systematically applies make-up, transforming the ‘plain’ to the culturally acknowledged notion of ‘beautiful’. What the inclusion of these pieces bring into focus, is that despite the varied approaches which Antin adopts: masquerade, performance or document, at the heart of the work lies a continued critique of the representation of the female body.